​When seeking to open Solo 401k, first familiarize yourself with the controlled group definition as it may restrict you from opening a Solo 401k. When a business is treated as a member of a controlled group, the controlled group is treated by the IRS as a single employer for retirement plan purposes, including Solo 401k plan; all the businesses are treated as one business. As such, the employer must take into account all employees of the controlled group of businesses when determining employee eligibility and making contributions to a SEP, SIMPLE or qualified retirement plan, including a Solo 401k. Two or more trades or businesses under common control–related through common ownership interests–make up a controlled group (Treasury Regulation 1.414(c)-2). A controlled group of employers may take any form such as sole proprietorships, partnerships, S-Corporations and C-Corporations, LLC and tax-exempt organizations, or a combination of any of these. If the business owner has multiple businesses and is looking to open Solo 401k, he or she should first consult with his or her tax advisor to ascertain if multiple businesses make up a controlled group. There are three different types of controlled groups. A parent-subsidiary controlled group is made up of a parent organization and one or more subsidiary organizations or affiliates of the parent organization. 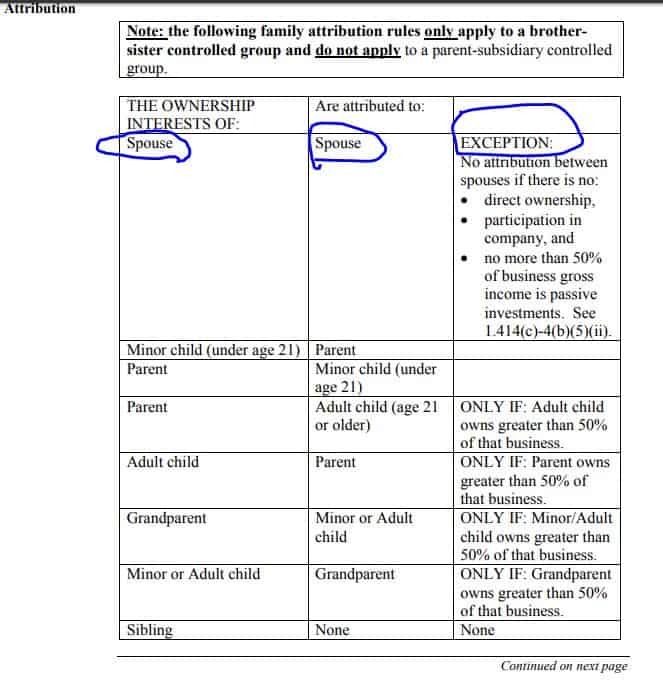 To make up a parent-subsidiary group, the parent organization must own at least 80 percent of one or more subsidiary organization (commonly known as having a “controlling interest”). Furthermore, at least 80 percent of each subsidiary organization must be owned by other members (if any) of the parent-subsidiary controlled group. To be considered a brother-sister controlled group, the same five or fewer persons must own, in aggregate, at least 80 percent of each of the organizations in the brother-sister controlled group. Also, the same five or fewer persons who meet the controlling interest requirement must have effective control (ownership of more than 50 percent) of each organization. A combined controlled group is made up of both parent subsidiary and brother-sister controlled groups that have a common parent organization from the parent subsidiary that is also a member of the brother-sister controlled group. 1. Which individuals or entities have ownership interest in the business? 2. What, if any, ownership interest does the business have in other businesses? A controlled group of employers is treated as one employer for Solo 401k eligibility purpose. This means that all employees under that group must be considered for eligibility for the plan. If eligible to participate, all employees (including the owner) must receive plan contributions and therefore a traditional 401k instead of a Solo 401k plan must be opened. While I know I’m currently eligible to establish a Solo 401k, I’m trying to determine if I will be able to continuing using in a few years given the situation described below. Does the IRS approve the following situation? I open a Solo 401k plan for my single-member LLC. My wife has no ownership of my LLC and does not make contributions to the Solo 401k plan. Separately, she also has her own LLC that is currently a single-member LLC. In 2-3 years, she plans to open a law practice and expects to hire full-time W-2 employees. Because she has no ownership in my LLC, did not contribute to the Solo 401k plan and I have no ownership in her LLC (that now has employees), I plan to continue contributing and operating the Solo 401k since I still don’t have any employees in my LLC. Does the IRS allow this or would the Solo 401k be disqualified simply because of our marriage even though we’ve kept our two businesses separate? I have been told by my attorney/accountant that I am no longer eligible for a solo 401k and should convert to a safe harbor plan. The current plan is under my LLC, which is a single member LLC with no employees owned entirely by me. But my wife is the sole member of another LLC that does have a full-time employee. I am being told that since we are married the employee would basically be considered mine as well. While a spouse’s ownership interest in a business is generally attributed to the other spouse, your situation may fall under the exception to the spousal attribution rules. Please review the attribution rules and chart on page 7-12 at the IRS link listed in the previous question above. Can wife open a solo 401k plan? Assuming business 1 and 2 don’t do business with each other, and the wife will no longer own 50% of business 1, business 2 can sponsor a solo 401k plan but only the wife can participate (not the husband). Currently one of my self-employed businesses sponsors a solo 401k which is a S-Corp and I own 100%. My wife is an employee and so the 2 of us are the Solo 401K plan participants. I want to know how much ownership I can have in other/separate businesses (LLCs or S-Corp) without violating any of the rules. I would think I can have any size ownership as long as there are no employees in any of those other businesses, but what if I own a percentage of one of those entities and there are employees? Your understanding is correct, as long as the new company does not have any full-time W2 employee. You ownership percentage would not affect your eligibility. However, the income from all your self employment activity would need to be aggregated from a contribution perspective (meaning: if one company reported a gain and the other had losses you would need to net them together). Can I own 100% if there are any number of employees as long as no employee works more that 1000 hours in a year? Correct, if you do have employees then each employee needs to work less than 1,000 hours a year. Or do I need to own only 50% or less if there are employees working for one of those entities as long as there are no employees working over 1000 hours per year? In order for your self-employed business and the other entity/entities form a controlled group: you, your spouse or another related party such as your mother, father, son or daughter would need to have a combined ownership percentage of less than 80% of the other entity. Therefore, even if the company had full-time W2 employees, the controlled group rules would not impact your Solo 401k as long as you together with related persons do not own 80% or more of such company. Please note that even if there is no impact under the controlled group rules, per the affiliated service group rules if you (or a related person) own less than 80% of a company with full-time w-2 employees & that company is affiliated with your self-employed business which sponsors the Solo 401k (e.g. interacting directly or indirectly, serving the same customers, etc.) the two businesses may constitute an affiliated service group (even though you own less than 80% of the other business with employees) which means that the employees of the other business will be considered employees for purposes of the Solo 401k and you will no longer be able to maintain the Solo 401k.